Braintree-born Nelson was a popular forward or winger wherever he went in a career that spanned almost 650 league games. He started locally with Southend United in 1979, spending four years at Roots Hall before moving to Swindon Town in 1983. 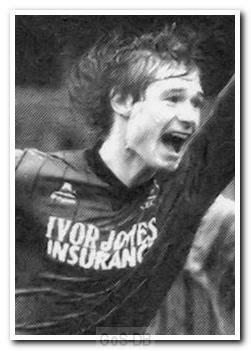 Joining Argyle in July 1985 for £15,000, he made a significant impact in a two-year spell, especially in Dave Smith's promotion season, and became a firm fans' favourite. So there was great disappointment when he requested a transfer at the end of his second season, which resulted in a move to Brighton where he enjoyed further success over the following four years. A brief loan spell at Notts County followed in 1990 before a permanent switch to Charlton Athletic, where he scored 37 times in 185 appearances over five years. Nelson returned to Devon in 1996 to complete his career with Torquay United, scoring 8 times in 36 games. He gained further prominence after his playing career was over through his sports writing with his two books, Left Foot Forward and Left Foot in the Grave, which chronicled seasons with Charlton and Torquay respectively. Both books were best sellers and short-listed for the William Hill Sports Book of the Year award. He also worked as the Commercial Executive of the Professional Footballers' Association (PFA) and played regularly for Old Southendians and Charlton Athletic's veterans side. Nelson was voted into Plymouth Argyle's Team of the Century during its Centenary Season.